Condition: minor imperfection, o.a. very good! 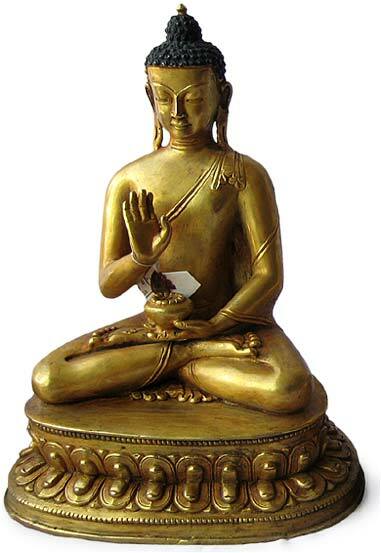 The Five Dhyani Buddhas or Great Buddhas of Wisdom are central features of Tibetan Buddhist practice and iconography. 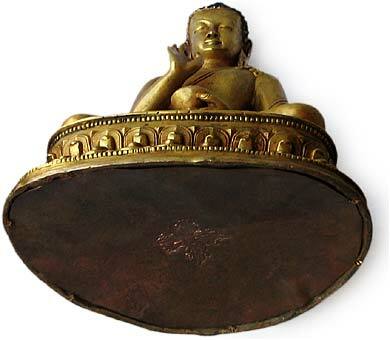 This particular collection of dhyani statuary from 19th century Tibet is finely cast with a high-hand finish. The style is reminiscent of the 14th century East Indian statuary in the simplicity and elegance of the lines. Each of these statues has a particularly beatific countenance, a youthful suppleness and a fluidity in the body and limbs coupled with the deities intrinsic wisdom and transcendence. 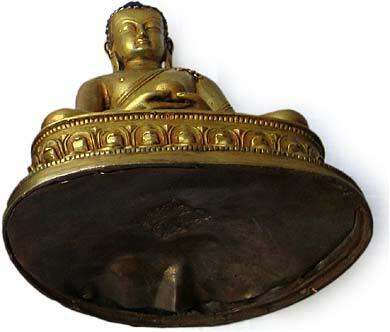 Each of the Buddhas (except for Vairocana) holds a medicine bowl. 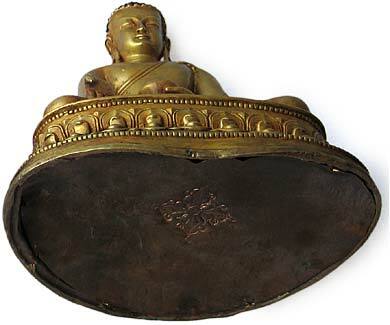 Vairocana’s hands are in a teaching mudra. 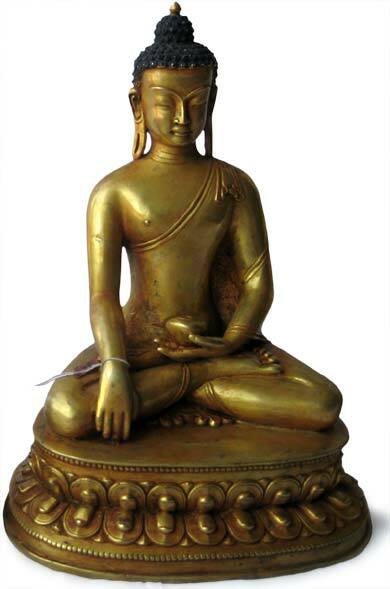 Vairocana is known as the Supreme Buddha, the Radiant One. 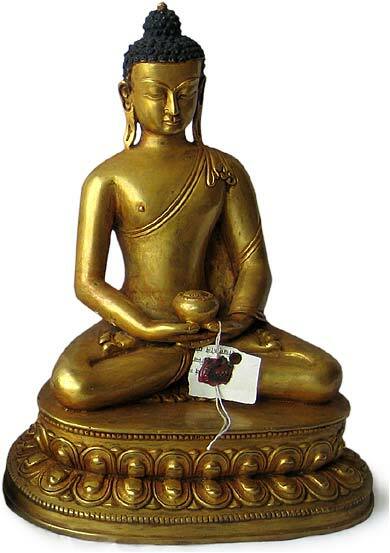 He represents all of the qualities of Dhyani Buddhas and is depicted in the Center. 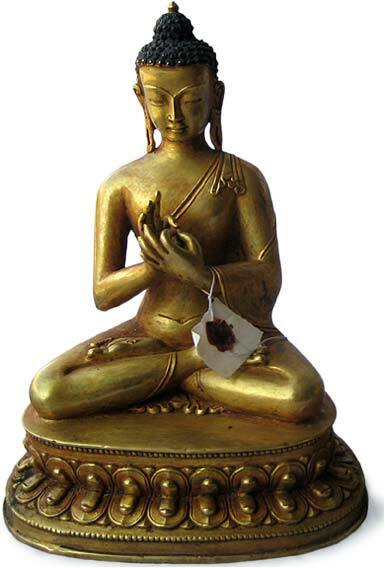 His color is white and he is thought to embody the teaching aspects of the Buddha. 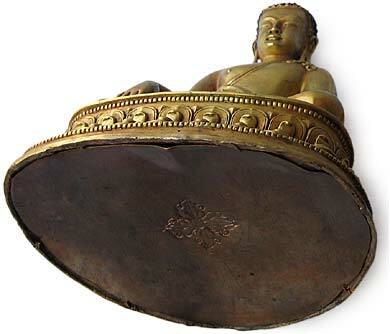 Vairocana has the ability to transmute ignorance and delusion into wisdom. 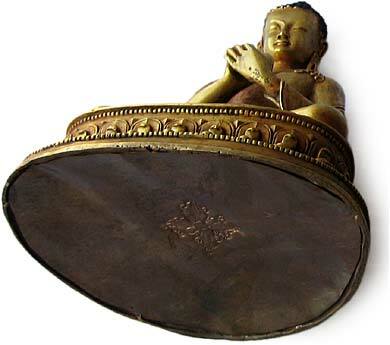 Akshobhya is the Immovable or Unshakable Buddha. He is believed to transform the human emotions of anger into a clear, mirror-like wisdom. Akshobhya’s color blue which is closely linked to the mirror symbolism. His direction is the East. Ratnasambhava is the Jewel Born One. This deity transmutes the poison of pride (spiritual, intellectual and human pride) into the Wisdom of Equality. His color is yellow and his direction is the South. Ratnasambhava is sometimes shown holding the chintamani the wish-fulfilling jewel that grants all desires and is the symbol of the liberated mind. 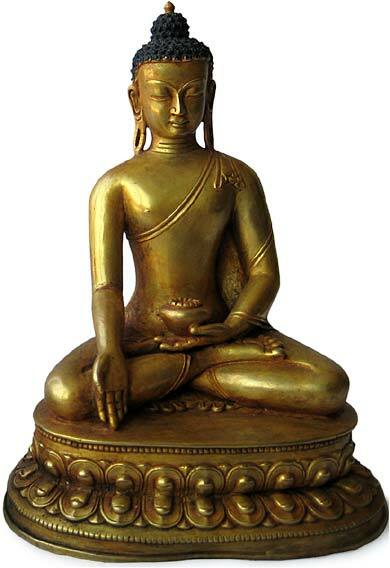 Amitabha is the Buddha of Infinite Light. He transforms misalignment into discernment. His color is red and his direction the West. Amogasiddhi is the “Almighty Conqueror or Lord of Karma”. His color is green and his direction is the North. He transmutes envy and jealously into all accomplishment.